Do your kids love Legos? Are they also Super Hero junkies? Yep, mine too. This groovy Batman Alarm Clock features the best of both worlds. It’s the all black version of Batman complete with dapper cape with a digital display on his chest that even little action hero fans can read. He has full Lego action so you can make him sit, stand or even hold things (Awesome). 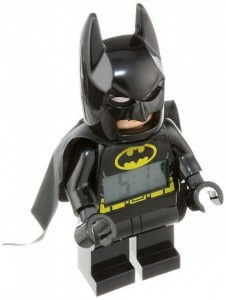 The Batman Alarm Clock has an easy to see lighted display and alarm clock. 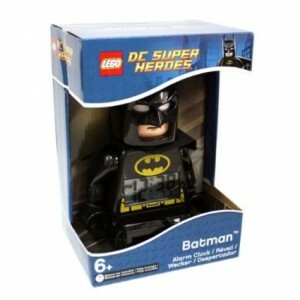 The snooze and back light functions are activated by pushing down on the Batman mini-figure’s head. With that spiky head I doubt they will be slamming down on that snooze button! This is one of those perfect accent pieces for a Batman themed room. It’s classic, stylish & it’s actually useful! This bad boy runs on 2 AAA batteries which are included (Yay!) and screwed into place with a ridiculously small Phillips screw…making it mostly kid proof. Since it has no cord the kids will want to get this guy into the action. We play a fun game of where did you put the alarm clock before bed every night with our kids. It’s totally worth it.